What makes great hunters so great? A big part of their success comes from great gear. Having proper weather protection, rain or shine, can make or break a trip out into the woods. The best rain hunting gear will work to keep you dry in any weather conditions that could compromise your hunting. Ensure your comfort by staying dry and ensure your success by being prepared with the best rain gear. This article reviews three types of rain gear: ponchos, jackets, and rain suits. The level of rain coverage you are looking for corresponds with the type of gear you will need. Ponchos can be effective but provide the least amount of protection from wet conditions. Jackets provide the next level of coverage, and suits are the most reliable for long exposure to rain. Consider the intensity of your outdoor activities when it’s raining to determine the best type of gear for you. While all rain gear is meant to be waterproof, the quality of a poncho, jacket, or suit material impacts how comfortable you remain. Some waterproof fabrics may feel hot and stuffy during high levels of activity, while materials like Gore-Tex are popular for being breathable against the body. If you are highly active in the rain or plan to use rain gear during summer storms, Gore-Tex is the best choice for your comfort. Some rain gear is easier to pack and carry than others. The most popular gear comes fully equipped with a storage bag, and some ponchos even fold into themselves for effortless transportation. Rain gear made of high-quality material often provides air flow. This breathability keeps you warm without stuffiness and is great for active bodies. Cheaper models will not be designed with your optimal comfort in mind. Poor quality rain gear may be cheaper, but will not actually keep you dry. It is important to invest in great rain gear so that it actually works, as quality often corresponds to price. There are many affordable options that make excellent rain protection. The best rain gear has a multitude of diverse uses. In cheaper models, you will not find these transformative qualities. Great rain gear often doubles as a shelter, blanket, or other emergency material when needed. Stay prepared by investing in quality gear. The JTENG Rain Poncho ranks “Best Overall” for providing hunters excellent protection in the rain. Weighing 1.6 lbs, this poncho is made of 100% PVC waterproof polyester material to keep you warm and dry outdoors. 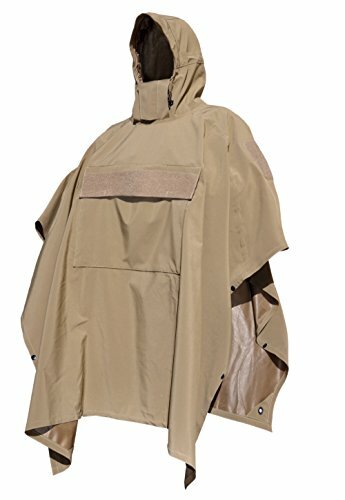 With its strong, high-quality waterproof material, customers find this particular poncho to be on the heavier side. However, this additional thickness contributes to your warmth in the rain. Customers love this model since it has been upgraded to include an adjustable head opening. This helps the poncho slide effortlessly onto the body. It is also popular for its versatility, as it easily transforms into a picnic blanket or tent. The JTENG Rain Poncho comes complete with a storage bag that doubles as a tarp, emergency shelter, or sleeping bag. It fits easily over a hunting backpack and its camouflage print is perfect for hunters. Some users report that the quality of the storage bag zipper is questionable, and others have experienced flaws in the hood stitching. However, the vast majority of customers love this poncho, ranking it “Best Overall” in rain gear for hunters. 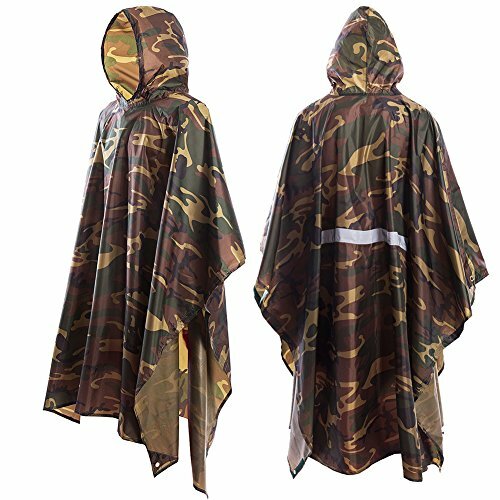 The JTENG Rain Poncho is the best rain poncho for hunters due to its incredible versatility and durability. As a camouflage-print product, hunters can stay stealthy in the rain while remaining warm and dry. It fits over hunting backpacks and is easily adjustable. While some customers experience design flaws, the overall verdict is that the quality of the JTENG Rain Poncho is unbeatable. The HAZARD 4 is a sleek, contemporary poncho inspired by the classic military design. Winning the title of “Best Packable Hunting Gear,” it is incredibly user-friendly, featuring a front pocket that doubles as its own storage bag. Hunters can simply stuff this poncho into itself for easy transportation. Additionally, it includes a vent for effortless drying. With the addition of grommets, it can double as a shelter. Customers appreciate how comfortable this poncho is on the body. Made of polyester and spandex, it is warm but breathable for optimal comfort. It also fits over hunting packs and comes in only one size, though it is available in either black or tan. Taller customers wish the poncho was designed with more length. Thoroughly taped seams are meant to ensure maximum rain protection, but the majority of users experience this poncho as more water-resistant than 100% waterproof. Therefore, your level of dryness in the HAZARD depends on how long you spend out in the rain. If you are looking for packable rain gear, the HAZARD 4 Poncho is the best choice for you. It easily stuffs into its own front pocket for nearly effortless transportation. The lightweight, modern design leaves hunters warm, comfortable, and fashionable. This particular poncho is more water-resistant than waterproof, so its effectiveness depends on the length of your rain exposure. For mild to moderate wet conditions, this poncho is perfect and great for packing. 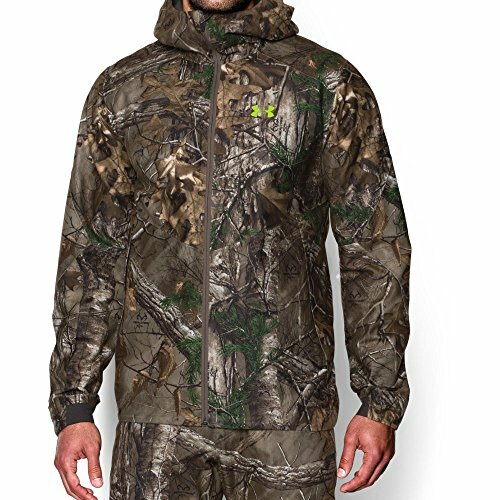 For fans of the Under Armour brand, this is the best hunting gear for your rainy days. This Under Armour rain jacket is 100% polyester with Gore-Tex features for ultimate breathability and waterproofness. Under Armour designed it with UA Storm technology, to keep you fully protected from harsh winds in any storm. The cuffs of this jacket are elastic to snugly fit around your wrists and keep water away from your body. The waist is also adjustable. Customers love the fit of this jacket and can wear a warmer jacket on top of this one if need be. This rain jacket comes fully-equipped with a storage bag for easy transportation. Its camouflage print is perfect for the outdoors. While the majority of users find this jacket to be durable and effective, a few have reported that its lifetime is not as long as they’d like it to be. If you love Under Armour, the Under Armour Rain Jacket is the best choice of rain gear for you. Hunters stay warm and dry in this jacket that features Gore-Tex for optimal airflow. UA Storm technology shields the body from harsh winds and keeps you dry. The camo print of this jacket is great for hunters and the design is adjustable for every body type. The SITKA Gore-Tex jacket is the best Gore-Tex gear on the market. Gore-Tex is the best waterproof material for air flow and comfort. This jacket is lightweight and easy to carry with the rest of your gear when the sun comes out. Its polyester face is designed to silence any rainfall that hits it, for ultimate stealth when hunting in the woods. Customers love the quality and durability of this jacket. Weighing two pounds, this jacket is heavier than its competitors, but heavier jackets can correspond to higher quality fabrics. Its fitted design is available in sizes up to 3-XL, making it the perfect jacket almost any type of body. If you are looking to buy Gore-Tex rain gear, this SITKA model is the best rain jacket for you. 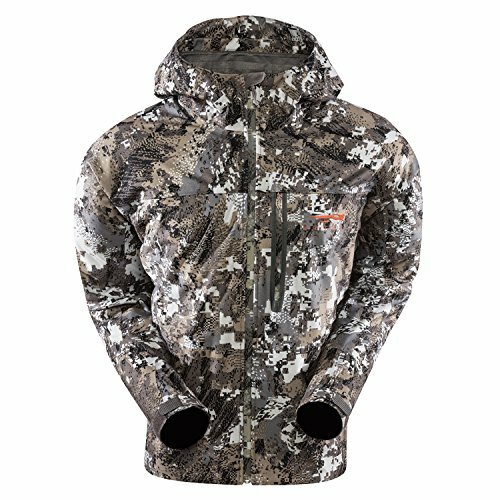 Stay silent, warm, and dry throughout any storm when hunting in this breathable jacket. Available in a wide array of sizes, you can easily choose the perfect fit. 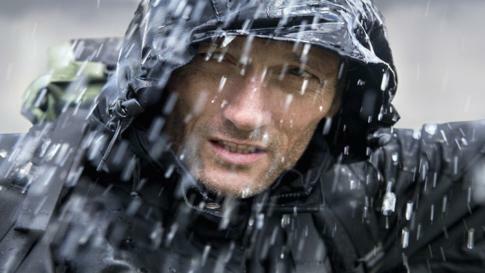 Gore-Tex is a great way to stay comfortable and protected from the rain. The Frogg Toggs All Sport Rain Suit is the best rain gear for the money. It is a complete set of rain gear, including both a jacket and pants. This suit is cheaper than many rain jackets and provides the same quality of waterproofness. The suit material is also breathable and wind-resistant. Customers love the adaptable features of the suit. The hood is both adjustable and removable, and the pants have an adjustable elastic waistband for ultimate comfort. Each piece weighs one pound, making this suit light and easy to carry. It is available in black, green, grey, or blue, so you can choose your favorite color. Some customers wish the jacket and pants came with pockets. Overall, this rain suit is great if you are looking for the most affordable option that remains of high quality. Both the jacket and pants prove waterproof in the rain. Breathable, wind-resistant features keep you comfortable. You can adjust the hood and waist as needed. 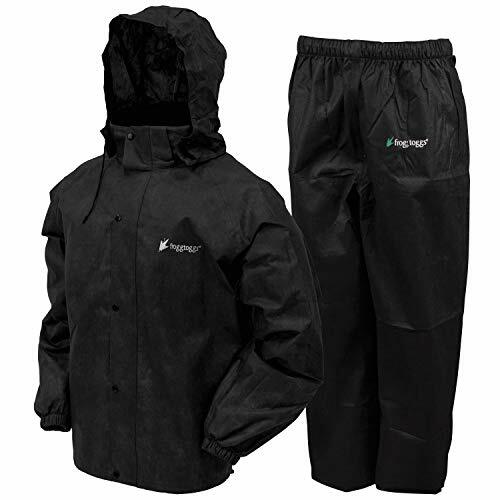 The Frogg Toggs All Sport Rain Suit is the best for the money because this full body protection is cheaper than the price of many single pieces. Rain ponchos slide over the head and do not have sleeves. The fabric may cover your arms by draping over them, but mobility may be more limited under a poncho. Ponchos are the perfect gear for light intensity rain activities, like hunting with short exposure to rain. Rain jackets are distinguished from other jackets by being waterproof. They are perfect for hunters with moderate activity in the rain and are great for mobility. Jackets keep your upper half totally dry and warm. Rain suits are a step up from jackets. Suits often come with both a jacket and a pant for ultimate rain coverage. As full-body gear, suits are best for hunters anticipating long exposures to rain. Choosing the best rain gear for hunting can be a great investment in your outdoor endeavors. Remember to consider what type of rain gear you will need, the quality of the gear material, and how easy it is to carry with the rest of your equipment. Investing in great rain gear can ensure your comfort in the stormiest conditions, and contributes to your overall hunting success.